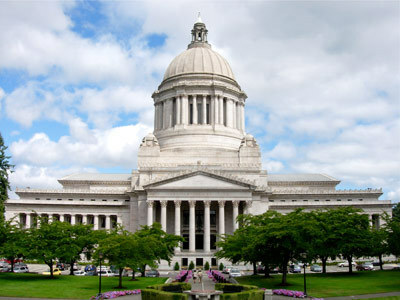 Washington State's legislature convened Monday, January 11, 2016. This is the second year of the biennium and will be a short session lasting 60 days. The paint stewardship bill heard last year is still active and a hearing is expected. Similar manufacturer-run paint stewardship programs already operate in Oregon, California, British Columbia, and seven other states. The Oregon Legislature runs Feb. 1 to March 5, 2016. The Washington state legislature will consider industry-supported paint stewardship legislation for the third year in a row. HB 1571 would create a collection program for the recycling or proper disposal of unwanted architectural paint in Washington state, similar to industry-operated PaintCare paint stewardship programs in eight states and the District of Columbia. Speaking in support of paint stewardship to the House Environment Committee in 2015, Steve Dearborn, CEO of Miller Paint Company, with stores in Oregon and Washington, called it a "retail driver of traffic to our stores" and went on to say that "if the state of Washington adopts this bill, Miller Paint would be interested in becoming a processor [of recycled paint]; it would add probably 25 to 30 jobs; it would keep all that recycling within the state and add jobs here in the state of Washington." HB 1571 has the support of paint manufacturers, environmental organizations, and local governments in Washington. PaintCare has been collecting and recycling paint in British Columbia, Canada since 1994; Oregon since 2010; California since 2012; Connecticut since 2013, Minnesota, Rhode Island, and Vermont since 2014; and Colorado and Maine since 2015. "One size does not fit all – this has certainly been a lesson learned working with local HHW/MRW programs in Oregon and California. Some have reuse rooms, while others reprocess paint at their facility and return it to the community, to name but two examples. We're making long-term partnerships – so we work to understand current operations, use that context to talk through possible options, and tailor each contract to fit." The Portland Business Journal wrote that the Oregon paint recycling program continued to log "impressive growth," processing "more than 621,000 gallons of paint in 2014, compared to some 581,000 gallons a year earlier." Roy Weedman, PaintCare's Oregon program manager, said these volunteer collection sites "are providing a valuable service to their community and playing a key role in the paint industry’s product stewardship initiative." In 2015, Metro, the regional government in the Portland, Oregon metropolitan area, drafted a statewide concept bill under which manufacturers selling designated products such as pesticides, solvents, and flammable liquids into the state would be responsible for providing stewardship programs for the collection and proper management of waste from those products. An informational hearing on the proposal was held at the legislature (see HB 3251-1 proposed amendments (PDF) and HB 3251-1 information (PDF)). Metro will be holding the first of three stakeholder meetings about the bill January 25, 2016. The stakeholder meetings will be designed to provide the opportunity for producers, local governments, state government, the solid waste disposal and recycling industry and other members of the community to share their perspectives on the proposal. Additional information on the meeting will be forthcoming: contact Scott Klag, Senior Planner, Metro. The U.S. Senate passed TSCA reform legislation in December, which the Safer Chemicals Healthy Families coalition called a milestone, much improved over previous reform attempts, that nevertheless "comes with some big red flags". The U.S. House passed TSCA modernization legislation in June 2015 and the next step will be reconciliation of the two bills in a joint conference committee. The Intercept has a detailed article on chemical regulation and TSCA. UPSTREAM is developing a furniture extended producer responsibility (EPR) policy to address the coming wave of unwanted couches contaminated with flame retardants, and to pressure furniture manufacturers to discontinue the use of toxic flame retardants. EPR "ensures that the costs of end-of-use management are borne by producers and consumers, rather than externalized onto society as a whole." UPSTREAM Program Director Jamie Rhodes wrote that the "crux of this question is whether we can develop an EPR system that encompasses both the furniture industry and, separately, the manufacturers of one of the component parts of the product – the flame retardant producers. This is different from existing EPR programs, which operate as a regulation of the brand-owners only. There are legal and practical reasons to modify existing thinking to allocate primary responsibility further up the manufacturing stream." As You Sow, a corporate social responsibility (CSR) nonprofit, filed shareholder resolutions "aimed at making major pharmaceutical companies take responsibility for the collection and disposal of unused and expired drugs and accessories," according to a Dec. 14, 2015 article in Waste360: "Only about 1% of U.S. pharmacies offer a drug take-back program," said Conrad MacKerron, senior vice president at As You Sow. "Many people hold on to unneeded drugs because they lack easily accessible collection and disposal options, which can have tragic consequences." A Jan. 6, 2016 profile in GOOD on As You Sow highlighted their efforts to take extended producer responsibility (EPR) initiatives directly to shareholders, to "shift the funding of recycling from taxpayer to companies..." because "leaving the financial burden with the individual" is not the best way to improve recycling rates. On TerraCycle's monthly webinar in December 2015, founder Tom Szaky explained extended producer responsibility (EPR) for packaging as "internalizing the externalities of production," both internationally and in the US, the voluntary form TerraCycle embraces in the absence of legislation, and how they work with manufacturers/producers. The EPR portion can be heard at about the 22 to 28-minute mark (free registration required). The Product Stewardship Institute (PSI) 2015 Annual Forum in December recognized "key individuals, agencies, and companies that have played a significant role in moving product stewardship forward during the last 15 years" including to two NWPSC leaders: the 2015 Loyal Steward Award to Scott Klag of Metro Regional Government, Oregon; and the 2015 "Gandalf" Award for Exceptional Guidance and Advising to Dave Galvin of LHWMP and King County DNRP, Washington.